For environmentalists, the word “business” often raises the specter of pollution. High-profile incidents such as the Volkswagen emissions scandal and the BP oil spill remind us how businesses often profit from pollution, causing a total of $4.7 trillion in environmental damages per year. Despite the rapid growth of renewable energy, the world economy remains reliant on fossil fuels. And when projecting global emissions, the IPCC has shown how business-as-usual scenarios are likely to seriously disrupt our entire ecosystem. Simply put, business in its current form is a disaster for the environment. This January, World Resources Institute and The Nature Conservancy released The Business of Planting Trees, a report I coauthored that aims to answer that question. We researched over 140 businesses around the world and featured 14 of them that focus on restoring land. While engaging with these businesses, we were struck by the ingenuity of their ideas. Restoration has the potential to become imbued in so many aspects of our lives. Ecoplanet Bamboo, a company planting over 13,500 hectares (33,500 acres) of bamboo, is harnessing the plant’s rapid growth rate to develop an abundant source of plant fiber. This sustainable alternative to wood fiber can be used to produce tissue paper, packaging and construction materials, quality charcoal, and other products. BioCarbon Engineering has developed cutting-edge drone technology for restoration, enabling rapid tree-planting even on difficult or remote terrain. By shooting seed-pods into the ground, the company is able to plant trees up to 150 times the rate of traditional hand-planting methods. Tentree is an apparel company that has committed to planting 10 trees for every piece of merchandise it sells. By tying its product sales to restoration, the company has planted more than 18 million trees since 2012. While these companies range widely in size and maturity, the diversity of industries in which they operate shows that sustainable businesses are not limited to a single niche. There is a world of business opportunities available for investors and entrepreneurs in this space. Each of these ideas offers a model of making money while benefiting the environment. 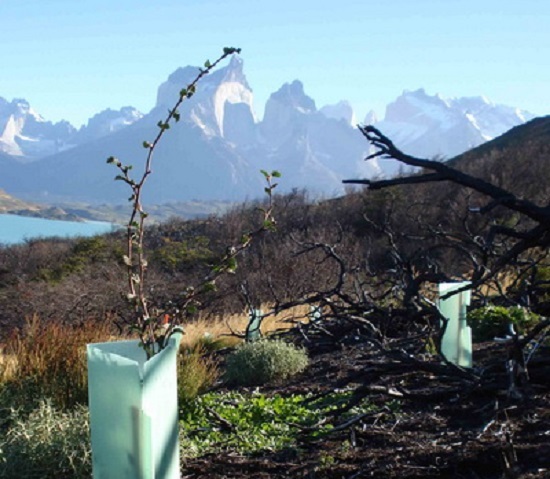 This tree is part of a planting project done in Patagonia. This is not to say that restoration is a surefire way of making easy money. In fact, there are several barriers to restoration finance that have limited investment in the space. For example, some restoration business models don’t generate revenues until trees mature after a decade or more. This is a timeframe that is too long for many investors. In other cases, restoration businesses may be too small to attract capital from institutional investors, which rely on large-scale deals to lower transaction costs and make the investment pay off. Still, these barriers can be overcome through policies, strategies and financing. One approach is to focus on restoration business models that mix short- and long-term cash flows to deliver returns more rapidly. Planting annual crops alongside trees would be one example. Aggregating projects is another strategy to attract capital. ForestFinance Group, which invests in restoring degraded forest landscapes in South America and Southeast Asia, currently manages $100 million for more than 18,000 clients by bundling small restoration projects into investment products. This kind of financial innovation, coupled with a favorable policy environment, can change the status quo and funnel investment into profitable businesses that do good. We’ve seen that businesses that benefit the global ecosystem are already at work around the world. Collectively, then, we need to realize that businesses have the potential to do good for people and the planet while delivering returns. We need to hold businesses responsible for the impact they have on the planet. The economy is a reflection of what people value. By advocating for policies that give incentives to sustainable businesses and penalize companies that pollute, we can shift the economy such that businesses contribute towards a sustainable, equitable and prosperous world. This op-ed is by Andrew Wu, research analyst for the New Restoration Economy project co-sponsored by World Resources Institute. He is a graduate of Yale School of Forestry & Environmental Studies and a former co-organizer of the Nature's Returns webinar series.